This list provides an overview of books concerning acoustics, psychoacoustics, and the psychophysics of music. The Physics and Psychophysics of Music: An Introduction. Juan G. Roederer. Springer-Verlag. 2008. ISBN 0387094709 (hardcover). This introductory text deals with the physical systems and biological processes that intervene in what we broadly call "music." It analyzes what physical properties of sound patterns are associated with what psychological sensations of music, and describes how these sound patterns are actually produced in musical instruments, how they propagate through the environment, and how they are detected by the ear and interpreted in the brain. 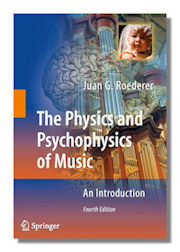 Without using complicated mathematics, the author weaves a close mesh between the disciplines of acoustics, psychophysics, and neurobiology, offering an integral picture of not only the science of music, but also the "music of science", that is, the beauty and excitement of scientific research, reasoning and understanding. This text should be accessible to undergraduate-level students, whether from science, arts or engineering schools, but it should also be useful to professional musicians, physics educators, acoustical engineers and neuroscientists. The fourth edition incorporates recent research on tone generation in musical instruments and latest findings in brain science, including substantially updated coverage of psychophysics and brain function relevant to music perception, new results from tomographic imaging, and new understanding of the neural processes responsible for human consciousness and the emotional response of the brain to music. 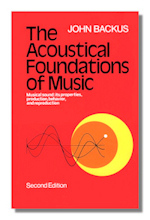 Fundamentals of Musical Acoustics. Arthur H. Benade. Dover Publications. 1990. ISBN 048626484X (paperback). 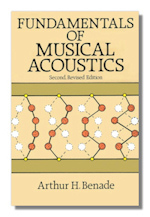 Comprehensive text on everything acoustical important to music-making. Over 300 illustrations, experiments, questions and examples at the end of each chapter. Harmony: A Psychoacoustical Approach (Springer Series in Information Sciences, 19), Richard Parncutt. Springer-Verlag. 1990. ISBN 0387512799 (hardcover). Musical Acoustics. Charles Aaron Culver. McGraw-Hill. 1956. ISBN 0070149046 (paperback). Musicians' Guide to Acoustics. Murray Campbell, Clive Greated. Schirmer. 1987. ISBN 0028701615 (paperback). The Physics of Musical Instruments. Neville H. Fletcher, Thomas D. Rossing. Springer-Verlag. 1998. ISBN 0387983740 (hardcover), 0387941517 (paperback). While the history of musical instruments is nearly as old as civilization itself, the science of acoustics is quite recent. By understanding the physical basis of how instruments are used to make music, one hopes ultimately to be able to give physical criteria to distinguish a fine instrument from a mediocre one. At that point science may be able to come to the aid of art in improving the design and performance of musical instruments. As yet, many of the subtleties in musical sounds of which instrument makers and musicians are aware and remain beyond the reach of modern acoustic measurements. Indeed, for many musical instruments it is only within the past few years that musical acoustics has achieved even a reasonable understanding of the basic mechanisms determining the tone quality, and in some cases even major features of the sounding mechanism have only recently been unraveled. This book describes the results of such acoustical investigations – intellectual and practical exercises of great fascination. 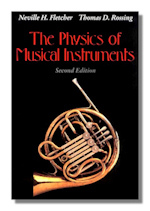 Addressed to readers with a reasonable grasp of physics who are not put off by a little mathematics, this book discusses most of the traditional instruments currently in use in Western music. This second edition has been thoroughly revised to take into account the insights arising from recent research, and to generalize or clarify the presentation in many places. The book should continue to serve as a guide for all who have an interest in music and how it is produces as well as serving as a comprehensive reference for those undertaking research in the field. Music and the Mind Machine: The Psychophysiology and Psychopathology of the Sense of Music. R. Steinberg (Editor). Springer-Verlag. 1995. ISBN 0387585281 (paperback). Research in music is a multidisciplinary matter. Experts from very different fields in science report the most recent data from their own research and thereby show today's knowledge concerning music and neuropsychological sciences. This includes the developing and adult brain, neurological and psychiatric diseases as well as the battery of the most recent development in brain imaging techniques. Horns, Strings, and Harmony. Arthur H. Benade. Dover Publications. 1992. ISBN 0486273318 (paperback). 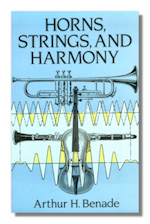 Introductory text explains scientific and aesthetic aspects of musical sounds. Simple and complex vibrating systems, ear's reception of sound, sound-making capacities of piano, violin, trumpet, bugle, trombone, oboe, clarinet, flute, saxophone, many other instruments. 76 illustrations. 288 pgs. Clarinet Acoustics. O. Lee Gibson. Indiana University Press. 1998. ISBN 0253325765 (hardcover), 0253211727 (paperback). Professor Gibson begins this first complete study of the acoustical properties of the clarinet with a history of the instrument, a survey of the instruments of famous exponents and the characteristics of the national schools of manufacture. Greek Musical Writings Vol. 2: Harmonic and Acoustic Theory (Cambridge Readings in the Literature of Music), Andrew Barker (Editor). Cambridge University Press. 1990. ISBN 052130220X (hardcover). This second volume of Greek musical writings contains important texts on harmonic and acoustic theory, illustrating the progress of these sciences from their beginnings in the sixth century B.C. over the subsequent thousand years. Writers represented include Pythagoras, Plato, Aristotle, Theophrastus, Aristoxenous, Ptolemy and Aristides. All the Greek texts are newly translated by the editor. Some replace inadequate existing translations; other, significant portions of the book include much that is essential for an understanding of medieval and Renaissance musicology, and have not previously been published in English. Dr. Barker provides detailed and authoritative commentary and annotations to all the texts. Each section is prefaced by an introductory essay and some of the more complex issues are discussed further in appendices. The Acoustical Foundations of Music. John Backus. W.W. Norton & Company. 1977. ISBN 0393090965 (hardcover). Explores music's scientific principles, the physiological properties of sound, how the ear perceives music, the effect of the acoustic environment, how instruments produce their sounds, and new computer applications in music. Second edition. The New Stereo Soundbook. Ronald D. Streicher, with Everest, F. Alton. Audio Engineering Associates. 1998. ISBN 0966516206 (hardcover). A comprehensive reference covering all aspects of stereophonic sound: how it exists in nature, how it is perceived by the human hearing mechanism, the various factors that influence how it is recorded and reproduced, and an up-to-date chapter on multi-channel and surround sound systems. The complete 1934 patent of Alan Blumlein, an extensive list of references, a glossary, and cross-referenced Index complete the features of the book.